Why would you take clean house tips from someone who hates to clean? Because who better to tell you how to get your house clean and tidy as quickly and easily as possible? Not sure about that? Read on! The information in this post can take you from hot mess to Queen of the castle without losing your mind in the process. Are you ready? Let’s go! When I was a teenager, I read my full horoscope one day, and it said, “Housework bores you. You’d rather lead a crusade.” When I looked up from the magazine at the piles of clothes on my floor, clean and dirty and my cluttered vanity and dresser, I had to agree. I never understood my mom’s glee at having a clean house. It’s a job that never ends, and I hated every moment of getting it that way. Because of that attitude, I rarely cleaned my room in high school or college and probably made my poor roommates miserable in the process. Teri, Johannah, and Mimi, if you ever happen to read this, I apologize for the mess I was, literally and figuratively. Fast forward 10+ years, I’m married with two children and a third on the way. On the way home from picking my husband up at the airport from a business trip and in the middle of a remodel of our only bathroom, my water broke 13 weeks early. I spent the next 8 weeks in the hospital and my son, born by emergency c-section, spent five additional weeks in Neonatal Intensive Care. I brought home an immune compromised baby that needed a clean and organized living space. Yikes! On the bright side, the remodel was finished. On the not so bright side, everything from the bathroom was sitting on my dining table because I refused help when my sister in laws offered to do it for me because even though I didn’t want to do it, I didn’t want them to do it for me. Pregnancy hormones are weird. I wish I could tell you I figured out how to easily tidy up my home and become a wonderful housekeeper, but I didn’t. I tried everything, and all I felt was resentful. Wasn’t it enough that I was taking care of a sick baby and his two very active brothers? Now I had to figure out how to take care of a home too, something I couldn’t do before I had any children at all. There was a lot of yelling and frustration in the beginning, and that’s why I’m sharing this information with you right now. I want to spare you that pain. Some of you won’t like what I’m about to say, but if your home is a mess, it isn’t the fault of your children. Yes, they contribute, but I promise you that when you stop blaming them and start putting better routines into place, life changes. The truth is that getting and keeping a clean home is simpler than you think, even if you hate cleaning. 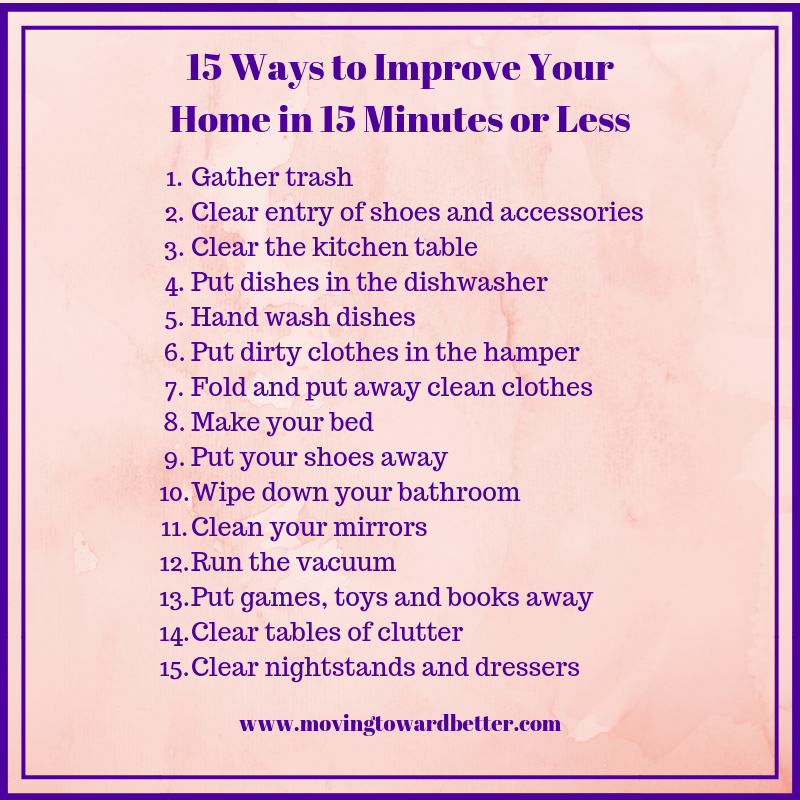 Since 2002, I honestly kept my home clean and tidy enough for an immune compromised child in 30 minutes of hands on time per day or less, and now I’m sharing those clean house tips with you. I know you think you’re different. You think you can’t possibly do that. Wanna bet? If you follow what I’m about to teach you, I promise you’ll see progress. Practice this for 30 days, and you’ll be amazed at the transformation. First, let’s start with The Magic of Fifteen minutes. Read this post, and you’ll understand the concept better. Today, I cleaned both my bathrooms in less than 15 minutes and ran the sweeper on my first floor. Think that’s impossible? I promise you it is very possible because I did it. I was a skeptic too because it always took me 30 minutes or more to clean each disgusting bathroom when I finally got around to it, but I was wrong. The best part of mastering this was after convincing myself, I got my kids on board too. During breaks and summer vacation from school, we cleaned every day for 15 minutes. After we finished, we did something fun. Do you know how easy it is to get kids to help when they get to watch movies, go to the park, the zoo or the amusement park afterward? It was easy peasy for me. A huge benefit of that was our boys learning to pick up after themselves, so they didn’t have to do another fifteen later in the day. It really was like magic, and by using a timer and the family friendly music of their choice, two more of my favorite clean house tips, it was like a game of Beat the Clock. I kept a timer on each level of our home upstairs, main level and downstairs. You can purchase them by clicking here. Some days I’m on the struggle bus like everyone else. I have no focus, and mojo is just a monkey on a TV show. These are the days the 15-minute principal works best. I start with my list and timer. For the first fifteen minutes I make and organize my list. If it’s a particularly rough day, I spend fifteen minutes working and fifteen minutes resting, looking at social media or reading. I also listen to music or an audio book while I work. I am amazed repeatedly at what I can accomplish during those fifteen minutes of focused work time, especially on the tasks I dislike the most. Here’s an interesting idea; your perfectionism is why you procrastinate. The first time I heard that I laughed out loud. If anyone saw the state of my house, I was sure they would laugh too. In my mind, anyone with a house like mine could not be a perfectionist. It was mind blowing to find out the truth of that statement. Perfectionism says we need to finish a job when we start it. How disempowering is that? Is housework ever finished? Why do we think spending two to four hours cleaning a house has value but cleaning 30 minutes per day doesn’t? Duh! Want to know what’s awesome? Having your home clean enough for company to stop over, for your kids to have play dates and for repair people to come into your house without you having to apologize any day of the week, not just Saturday and Sunday. That, my friend, is successful housekeeping. I am living proof that this fifteen-minute concept works, and if you’ve failed at everything else you tried, I’m betting it will work for you too. Are you ready for your own clean house? Get started today.